It was December, Grand Bahama, East end of the island. We were floating in maybe 2 feet of crystal clear water, turtle grass gently swaying in the current below us as we rode silently on the tide. This was my first time in a flats boat on my first Bahamas trip. My dad was in the boat, the guide was on the poling platform and I was up. My rod was poised, the fly was between my fingers, I had line out and ready and my eyes were scanning the water in front of us behind my polarized lenses. I was ready to make this happen. The guide suddenly speaks, “Bones, sixty feet, do you see dem?” he asks, pointing in the general direction. “No” I say… I see nothing… just the uneven patchwork of the bottom… I see nothing. “I don’t see them” I say… again… nothing. I’m starting to feel equal parts nervous and stupid. Then… the guide says it… maybe the best line to a rookie bonefish angler in the history of bonefishing. Suddenly, I see the fish… all of them. How did I not see them before? The cast is made, the bone is on the fly, the fight is on and the fish is landed. In this picture, Ray was tracking a school of bones just off camera. 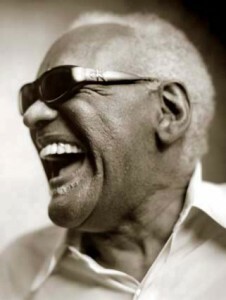 That Ray Charles line still cracks me up. The main issue for me continues to be just seeing the fish. I can make the cast, I have confidence in the tackle, but if you don’t have a target, you are just standing there with a stick in your hand. This entry was posted on Friday, August 28th, 2009 at 4:07 pm	and is filed under Fish Tails. You can follow any comments to this entry through the RSS 2.0 feed. You can leave a comment, or trackback from your own site.